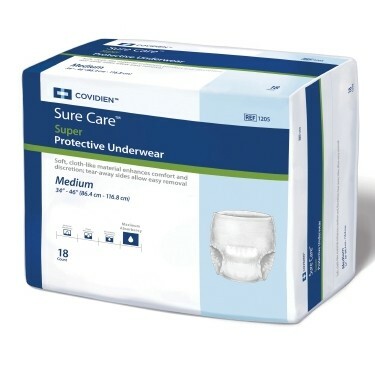 SureCare Protective Underwear by Covidien provides maximum protection for heavy incontinence all wrapped up in a comfortable, secure fit. Their extra heavy absorbency status means your skin stays dry and healthy as liquids and odors are locked into the underwear's core. Available in packs or cases and in sizes Medium, Large and X-Large. Medium - 34" - 46"
Large - 44" - 54"
This pull up was comfortable and works great if you only leak. If you have an accident it leaks and runs down your legs. Cons:Doesn't hold well. It leaks if you have more than a leak. Excellent product! Comfortable and has restored confidence.